Each month and each Zodiac sign have its own flower and August is no exception with the Gladiolus. With their sword-shaped leaves and brightly coloured funnel-shaped spiky flowers, the Gladiolus are widely cultivated and are native to various tropical locations and South Africa. Gladiolus are also known as Gladiola and Sword Lily The latter could be traced as far back to the Roman Gladiators, as the flowers symbolized their mighty swords. In mythology, there were many tales of gladioli springing blood shed by the sword of the gladiators. On a lighter note, the Roman Empire it was believed that during birthday celebrations, family and friends would offer many gifts as a symbol of congratulations. Among these gifts would be gemstones such as the peridot (probably the beginnings of the monthly birthstone), jewelry and you guessed it – flowers! In Victorian times the Gladiolus (or Sword Lily) was believed to “Pierce through a lover’s heart”, with the hidden message being “Love-at-first-sight”. This was very important during this era, where the rules of etiquette surrounding the laws of romantic attraction were highly guarded. Hence their hidden conversation could easily be communicated through flowers. If you were not well versed in this language, you could inadvertently turn away your soul mate, if you chose the wrong flower-response! The widely accepted meanings of the Gladiolus are strength and character, which coincides with their brightly coloured flowers of pink, red, white, yellow and orange, likened to a power rainbow! 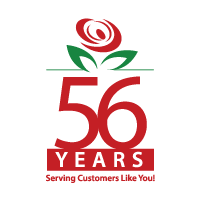 The best times to present someone with these lovely flowers would be to celebrate Friendship Day (the first Sunday in August), Sisters Day (August 5th) and Senior Citizen’s Day (August 8). To add real significance, you could add another August flower, the Poppy to the bouquet. 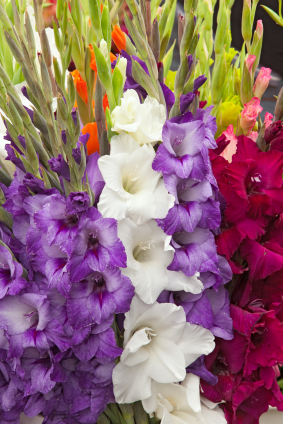 Did you know that Dame Edna wears the Gladiolus all year long? Yes, because she adopted it as her trademark flower during her stage acts! These beautiful flowers grow between July and September and require full sunlight. They are as easy to care for as the rose and are just as stunningly beautiful to look at. Some of the medicinal uses of the Gladiolus are to cure the common cold, diarrhea, painful menstruation and constipation. It was believed that to “get things moving” such as congestion from colds, blood clots, getting rid of poisons in the body, constipation, et cetera that one should paint their room an invigorating colour like red. As a result, the Gladiolus with its bright red flowers were an excellent choice to add to the “red-room” and aid in their recovery. Next time if you, or someone you know is feeling sad, depressed or under the weather; pick up this beautiful flower and throw it in to a brightly-coloured, “pick-me-up” bouquet. The intended recipient will be GLAD! PS. Have you seen all our Lily arrangements?